It is not every day that economists can identify a market where consumers are significantly better off after large price increases. 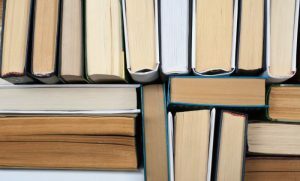 Nonetheless, a new working paper by Ellison and Ellison proposes and substantiates a model of the online market for used books that—thanks to improved buyer-seller matches made possible by new search technologies—finds exactly that. A copy of “Sally Goes Shopping Alone,” a children’s book from the 1950s, was gathering dust in a used bookstore in Boulder, Colorado, for years. Some people interested in used children’s books came in to shop, but there were many titles to choose from and no one was interested enough in “Sally Goes Shopping Alone” to pay the $4.50 price that the seller had marked on it. Meanwhile, in Cambridge, Massachusetts, a woman with a young daughter went to a used bookstore in Harvard Square in a search of that exact title. She would have willingly paid $20 or more to be able to read her mother’s favorite childhood book to her daughter. The store she went to did not have a copy, of course. It would have been an amazing coincidence if it had. She looked at the used children’s books they did have, but none was just what she was looking for. She left empty-handed. This would not have been an unusual story 20 years ago. But then the Internet changed the narrative completely. Now that woman in Cambridge would go to A Libris or AbeBooks or, more likely, Amazon or Google, type in the title of the desired book, and find one or a few or most of the used book dealers who had a copy to sell. Internet technologies that facilitate high-quality matches—consumers finding the product that has the best match with their preferences—have the potential of making some markets much more efficient and generating a lot of welfare, in other words, consummating the sale of “Sally Goes Shopping Alone” that never was made in the story above. In the early days of the Internet there was a great deal of hype about frictionless commerce. Consumers would get better and better at comparing price offers. This would intensify competition, force price levels to fall, eliminate price dispersion, and create a consumer paradise. In practice, the Internet’s immediate effects looked more moderate. Online prices were a little lower than offline prices and the law-of-one-price was still quite far from reality. In Ellison and Ellison (2009) we noted that the initial hype about frictions disappearing should never have been expected. 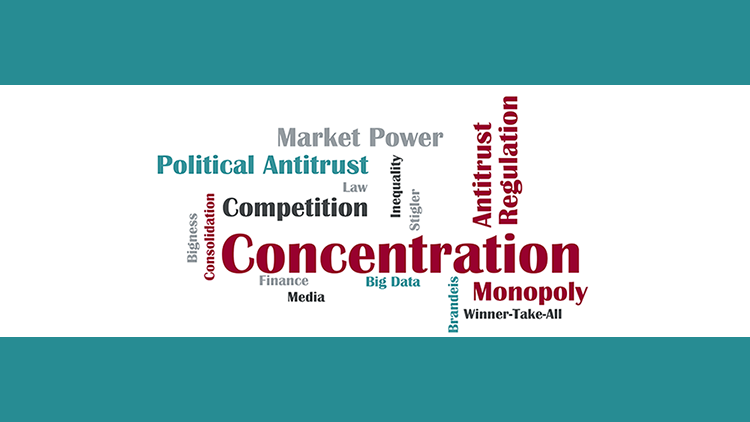 Internet technologies provide firms with the opportunity and incentive to engage in “obfuscation” and keep competition at least somewhat imperfect. We provided empirical evidence on obfuscation in one market and noted many others in which similar practices arose. But obfuscation is not the only reason why online prices may not have dropped as much as the hype suggested. In our working paper “Match Quality, Search, and the Internet Market for Used Books,” we use the example of the used book market to illustrate an alternate explanation with very different welfare implications which probably applies in many other markets. We argue that as the Internet has helped “Sally Goes Shopping Alone” (and many other items) find their way to the right homes, there can be a win-win situation. Increased buyer-seller match quality is akin to an increase in demand and drives prices higher. Sellers benefit from the higher prices. And consumers can be better off as well because match quality has improved. To bring out this argument our paper begins by developing a formal model in which sellers of unique items post prices and await the arrival of well-matched buyers. We assume that consumers are heterogeneous in their search strategies: some visit sellers directly while others use price-comparison tools like Amazon’s “Buy Used” button. And we assume that sellers are also heterogeneous in that some are better known or more visible to the direct-visiting consumers. The model’s most basic prediction is that the distribution of prices would change online because high-quality matches could shift up the price distribution but easy price comparisons could pull down the lower tail of that distribution. Then we used data we had gathered, both from brick and mortar stores and online, on over 300 different titles of used books. 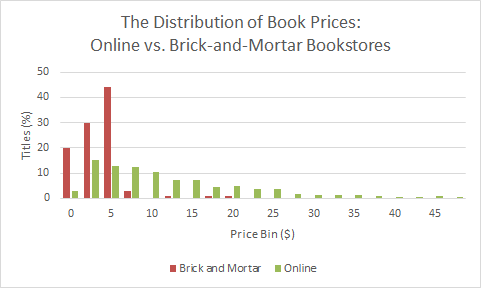 What we found was striking: used books were not only not cheaper online than in brick and mortar stores, they were significantly more expensive. When we looked more carefully at the subtle predictions of our model on changes in price distributions, we found strikingly strong support for our model in the data. The first graph below shows the distribution of brick and mortar prices for a set of mostly undistinguished out-of-print books in our dataset, which we refer to as standard titles. 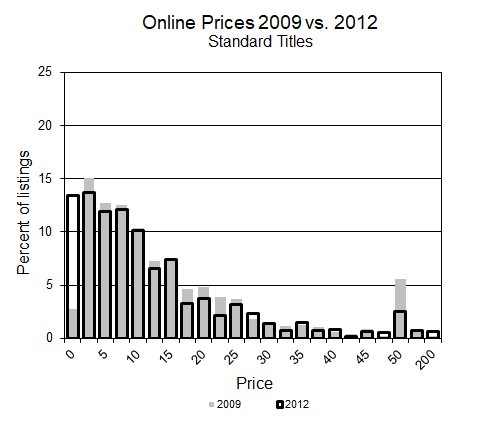 The second graph shows the price distribution of the same titles online. That prices are higher and more dispersed online could hardly be more clear. To gain greater confidence that the model we describe is really the reason for the shift as opposed to some other model, we go on to examine a number of more subtle predictions of the model about the differential effects that improved match-quality search would be expected to have on different classes of books and over time. For example, some books, say a book about the history of the Brahmin families of Beacon Hill, might be able to find high-quality matches sitting in a used bookstore on Beacon Hill and might not benefit as much from being listed on the Internet. So we separately analyzed what we termed “local interest” books and found, in fact, that markets for local interest books were not as dramatically affected by the Internet as those for “standard” titles. Another example is that we analyzed how price distributions shifted over time after Amazon acquired a major used book aggregator and used its inventory to populate their “Buy Used” button. Our model predicts that this should further pull down the lower tail of the price distribution while leaving the upper tail almost unchanged. And again, we find this is strikingly true in our data. Finally, we were interested in the welfare effects on dealers and consumers from being able to buy and sell used books online. Using our theoretical model as a basis, we constructed a structural empirical model of the market for used books that allowed us to make welfare statements. Our results from that estimation suggest that both dealers and consumers benefitted, with the majority of the benefit accruing to consumers. This result might not be surprising when you think back to the story about the used children’s book, but it is not every day that economists can identify a market where consumers are significantly better off after large price increases! We think our results for used books are relevant for a number of other markets as well, really any market where goods have idiosyncratic features that small numbers of consumers might care about and have to search for. Goods like antiques, collectibles, handicrafts, and art come to mind. One does not need to look further than eBay and Etsy to know these markets have also been transformed by the Internet. Although we are not usually in the business of making economic predictions, it might be interesting to speculate what these results suggest about the future of online commerce. In particular, one might think that large welfare gains are yet to be realized in online markets where match-quality is important but where the matching technology is lagging behind. For books, the matching technology is quite simple because books are so easy to describe with just a few words, their titles. There may, of course, still be scope for substantial additional improvements as better recommendation technology comes online, but clearly there have already been substantial gains. In contrast, match quality in clothing is extremely important to consumers, but the technology is still in its infancy. In fact, entire languages are being built and disseminated to describe products that were previously searched for visually. Terms such as “fit and flare,” “princess neckline,” “Louis heel,” and “capped toe” have entered the typical apparel consumer’s lexicon to verbally describe characteristics that used to be searched for visually in a brick and mortar store. 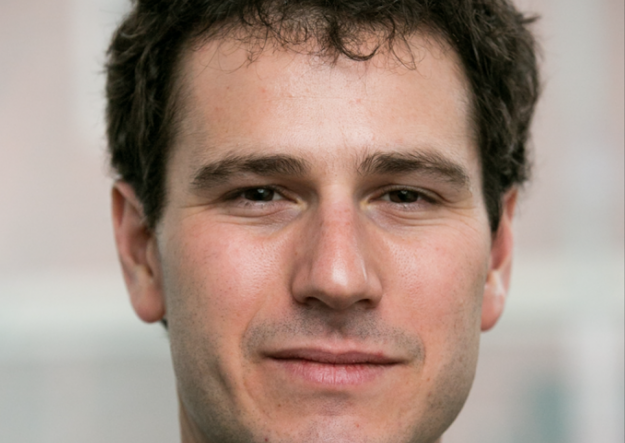 In parallel, pattern and shape recognition algorithms fueled by machine learning are working towards obviating these verbal descriptions and teaching computers to mimic visual search. We look forward to seeing how these improving technologies will confer benefits in the future. Meanwhile, our children have mostly grown up and our copy of “Sally Goes Shopping Alone” is happily sitting on our shelf waiting for the next generation. Sara Fisher Ellison, currently on leave at the Paris School of Economics, usually teaches economics at MIT as a senior lecturer and does research on various topics in industrial organization. Glenn Ellison is the Gregory K Palm Professor of Economics at MIT and currently visiting the Paris School of Economics. « Data Workers of the World, Unite!